Screened in pool enclosures, which are also commonly known as pool cages or by the less frequent and sometimes misunderstood title lanai, are such an excellent option for any home or resort that they deserve their own service page. Swimming pools and these protected and shaded coverings which are often outfitted with casual lounges, dining areas, and tropical elements, make such a great pair that it is easy to understand why it is rare to find one without the other down here in South Florida. Customers who have installed these have been happy to find their usage of their home's outdoor space dramatically increase, making the investment well worth it not only in terms of lifestyle value but home market value as well. Often enjoying the space with a morning coffee, a comfortable midday swimming session even on the hottest of summer days, or hosting fall dinners. Many additional upgrades are also available to allow for entertainment or increased temperature control, including the very chic option of installing large hanging ceiling fans for extra air circulation. 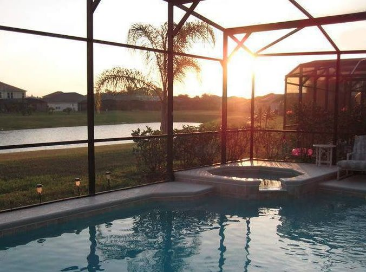 A lanai pool screen enclosure could be a perfect choice to aid in maintaining your swimming area as the relaxing getaway and spa like environment it is supposed to be, because after all when you want to wash away the stresses at the end of the day, the last things you'll want to have to encounter are bugs, debris, and more cleaning. 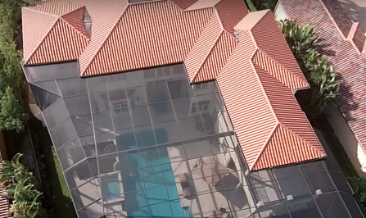 On top of these benefits you will also feel the added comforts and peace of mind that a lanai screen installation can bring to you and your family, from simply blocking out harsh UV rays or dangerous animals, to providing a completely sealed and lockable area of protection for younger ones. 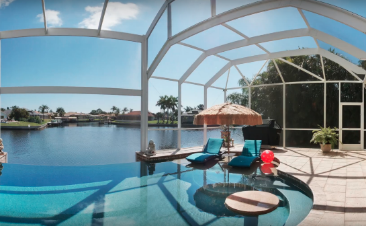 It is important to remember that when considering a pool screen and selecting possible configurations, the direction the lanai faces can play a crucial role in your experience with it. South facing structures typically receive sun all throughout the day and can become weathered faster as well as provide slightly less relief, while north facing can be a great choice for continual shade and comfort, but might not be the best option if you enjoy being graced by the light a little bit each day. West and east of course give you options to take advantage of either sunsets or sunrises, but have also been found to make your swimming area difficult to use during those times of the day when it is getting directly hit before the sun has fallen or risen. 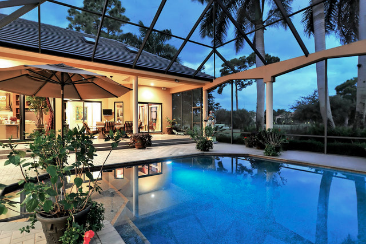 There are many great pros to enhancing your pool with one of our several solutions from Fort Lauderdale Screen Enclosures, be it home security, ease of maintenance, added value toward the home, their ability to withstand Florida's strong storms, and most simply just getting more swim time throughout the year. While there are not many cons to list at all, it is good to know that for some customers, an enclosure's effect on slightly cooling the water or limiting your yards outside landscaping may be an effect to consider. Contact us by phone today if you would like to hear more about what we can do to transform your pool space, or for specifics on lanai screen types, materials, or general ideas, and we would be happy to inform on these or provide you with the best pool lanai cost estimates and most well crafted products in all of Broward County.